Student engagement, recruitment and retention are critical issues in the post-secondary environment and this applies equally to students with disabilities. Increasingly we are turning to instructional videos that can be accessed online anytime and anywhere. This poster will highlight the work carried out to date on a video project by York’s Academic Innovation Fund. 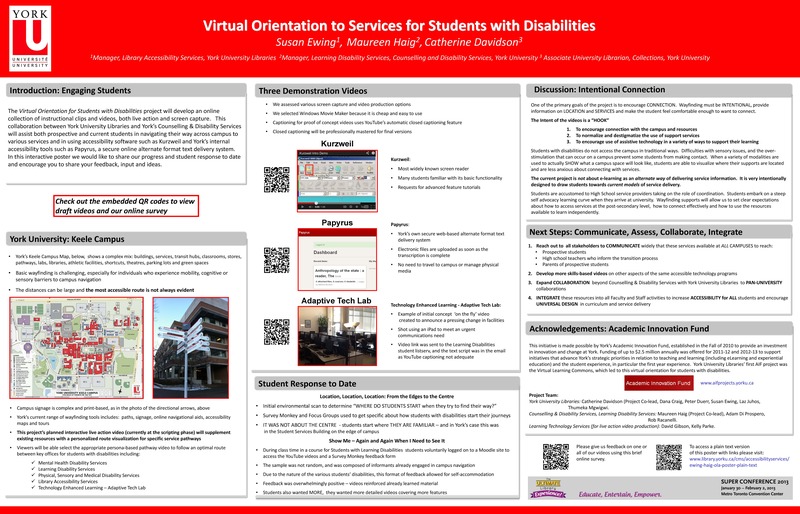 A joint venture between Counselling & Disability Services and York University Libraries, the end products will assist both prospective and current students in navigating their way across campus to various services and in using accessibility software (e.g. Kurzweil). ← Infographic: Online Ed – Implications for Libraries?